Skydiving is the ultimate Adrenalin Rush!Skydiving is an experience like no other. The thrill of free falling thousands of feet is a feeling you will remember for the rest of your life. Nothing more to pay! Your Australian Parachute Federation levy is included in the price. Your highly experienced tandem skydiving instructor will take care of the jump from takeoff to landing, and give you the confidence and peace of mind to truly relish the experience. 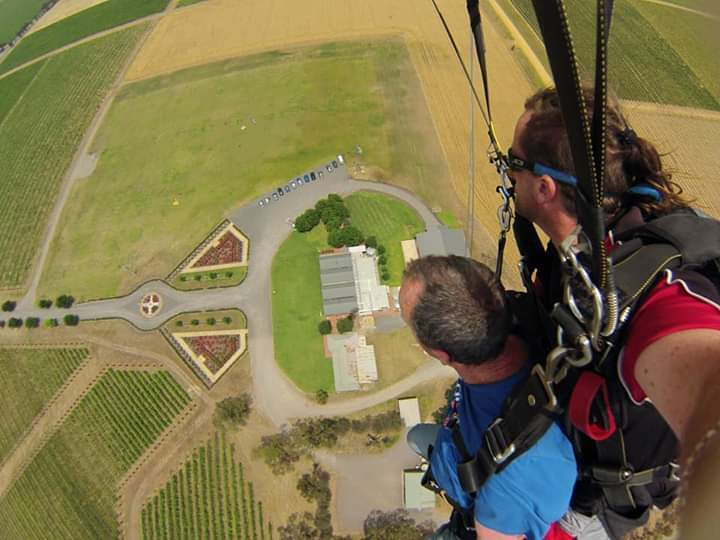 You require just 15 minutes of training before taking off from the Aldinga Airfield, your ground training session will cover all methods of canopy control and safe landing actions. Once the plane reaches the jump altitude you have chosen, you will be connected to your instructor, final safety checks will be completed, take a big breath, open the door, and…JUMP! From a 15,000 foot jump you will have up to 60 seconds of freefall. After freefall you will be able to communicate with your instructor, and you can fly the parachute yourself if you choose (at the discretion of your tandem master on the day). Bring a method of payment if you wish to celebrate with at the winery after your jump! Skydives usually take around 45 minutes to an hour however you should allow half a day for the whole event in case of low cloud cover (which may temporarily delay skydiving operations).